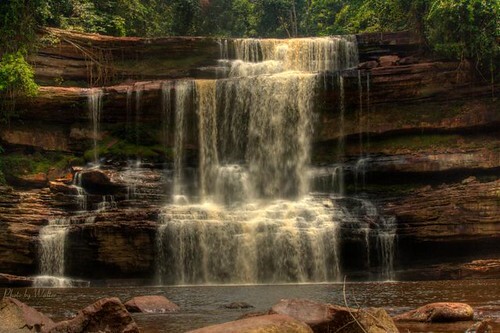 Maliau Basin which is also commonly known as the Sabah Lost World of Sabah is an extremely beautiful place with stunning seven tiers cascading waterfall. It is considered as one of the most spectacular and a pristine natural feature in Malaysia which is located in south-central Sabah which is about 40 km north of the Indonesian border. Here is a sneak peak video on what you will find should Maliau Basin be your next sabah jungle adventure. This Sabah Lost World was first discovered in the year 1947 by a British pilot. This discovery was reported in the Borneo Bulletin which was first published in 1953 but it failed to generate much interest. In the year 1981 this place was designated as a conservation area by the Sabah Foundation for the purposes of research, education and training along with Danum Valley Conservation Area. Then in the year 1988, an expedition into the basin of the lost world of Borneo was made but you will be surprised to know that only about 30% of the total area have been mapped till now, and only about 10% have been studied intensively. But irrespective of that Maliau Basin has already yielded more new species of plants and animals than many other places with many more years of studies. Later in the year 1997 the Maliau Basin Conservation Area was upgraded by the Sabah state government to a Protection (Class One) Forest Reserve and its size was increased from 39,000 to 58,840 hectares to include the outer northern and eastern escarpments and Lake Linumunsut. You will be glad to know that the efforts are underway to make Maliau Basin, the Sabah Lost World, Malaysia's third UNESCO World Heritage Site. Basically this particular Sabah Lost World looks like a big basin with a mile of lush green forest inside. Maliau Basin one of the best places for jungle trekking and bird watching, photography, night walks, night drives to spot nocturnal wildlife along the access roads, swimming and recreation hence it is a must see destinations while travelling on holiday to Sabah. The most interesting thing about this place is that it contains unusual assemblage of 12 forest types, comprising mainly of lower montane forest dominated by majestic Agathis trees, rare montane heath forest and lowland, and hill diperocarp forest. You will also be surprised to know that over 1800 species of plant have so far been identified in this area, including nine species of pitcher plant and at least 80 kinds of orchid, several of which are new records for Sabah and also the bio-symbiotic Ant plants. 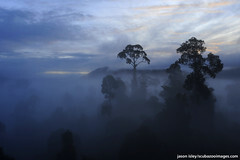 The Maliau conservation area contains about 74 dipterocarp species and the dipterocarp forest is found mostly on the Basin’s outer flanks and in the interior valley bottoms, and is rich in fruit trees. The forests in this place are some of the oldest and untouched in all of Borneo. The highlight of this place is the adventures trekking through the rain forest to the majestic 7 tiers Maliau Falls which is the largest and most famous falls in the area and could be reached within a day. Equally mesmerizing are waterfalls such as Giluk Falls, Gungseng Falls, Maliau Falls, Sebandar Falls, Takob-akob Falls and Upper Giluk Falls and tourists can also enjoy the night safaris. You can reach Maliau Basin by road either via Tawau or Keningau. Irrespective of whether you are starting your journey from Tawau and Keningau it takes around 4-5 hours to reach the Security Gate of Maliau Basin Conservation but four wheel drive is essential as the latter part of the journey is on logging roads. Ready for your once in a lifetime Sabah jungle adventure? Share your "Sabah Lost World" Adventure with us! 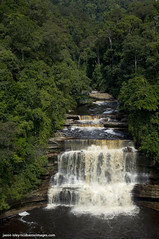 Hiked through the amazing Maliau Basin already? Share your experience with us, the WOW factors, and the less WOW factors too so that future visitors will know what to expect during this adventure. No tip is better than the ones provided by fellow travelers!